Listen up, marker fiends! ShinHan Touch Twin Markers are the cheapest professional markers you can find here in Korea. Most likely because they are made here. They come in a vast assortment of colors. You can buy various sized pre-arranged packs of colors. But everyone knows that the real fun is in picking out your own colors. If you don't know much about different colors, it's fun to just pick ones with names that you can easily learn. For example, pick food related colors: potato brown, lemon yellow, mint green, ice blue, fruit pink, chocolate. They have two sides: one fine and the other broad. These markers can often be spotted on the desks of Korean animation people. Storyboarder, Park Min uses bold colors in his storyboard work. He also uses them in his personal sketchbook. 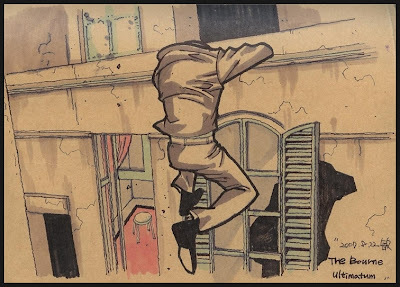 Here is a wonderful example borrowed from his blog. 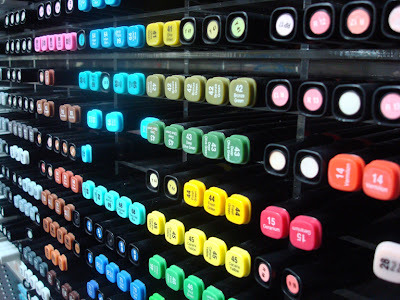 You can easily find these markers in art supply or stationery stores in Korea. You can also find them at the Shinhan Art website. Have you ever tried this marker out? What do you think? By the way, there is actually a cheaper brand. 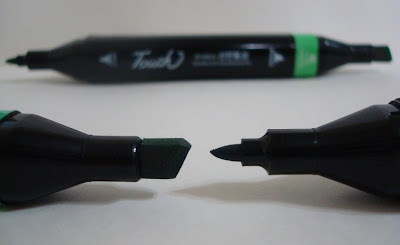 Alpha Plus Twin Markers (pictured above) are an even older and cheaper Korean brand of markers you can find straggling around art stores sometimes. Unfortunately, their poorly designed caps can easily damage the marker tips. Too bad! Yeah, bought a couple to get around 20 autographs by a famous Korean animator on my collection of his film posters back in 2006 (Diector Kim Chong Gee). I'm glad I bought them because he drew a detailed picture of one of his more famous characters at about 20cm x 20cm in height on an extremely rare 75cm x 100 cm Taekwon V poster that even he didn't have. The best place to buy art supplies is that large brown brick, ground floor art shop in Hongdae and the second best store is off to the side of the main gate at Ewha Uni. Well, that's what I think. Ohh, now that I think about it I bought one of those double ended markers in gold in order to get signatures on black backgrounds and it didn't like the canvas LP record style bag I kept it in- so it leaked everyhwere. Have you seen the female art students at Seoul Dae that carry all their art tools in fishing tackle boxes! It's a good idea. Wow, Alex! You've got some interesting stories to share! I knew about the Hongdae art store, but not the Ewha one. Thanks for the heads up! I'll have to check that out. I've seen various art supply containers, but I'm not sure about those tackle boxes. These are definately excellent markers but I must tell something very shocking about them. 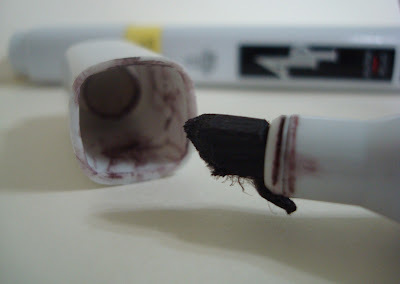 Some bad merchants import the black and brown colours of these markers to Saudi Arabia and sell them to women as brow pencils to be used on their faces at a very high price (about 8 American Dollars or even more). This is a kind of decieving people and harming them because there must be a side effect for using a paper marker on the skin. I myself bought one and used it a couple of times on my brows but then I checked the site on the internet and discovered the offensive act. Those profit makers should be punished immediately but I know that my voice will not be heard as usual no matter what I say or do. What a shame!! !